Sham: I moved your post as this topic seemed more appropriate. I used to have an auto from PJ signed in blue sharpie from a reputable L.A. radio station i got from ebay in 1999~2000.. i sold it... a bad regret, as the net and autographs in general are becomeing more untrustable..
BTW is this the biggest PJH forum?? 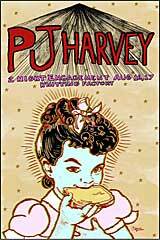 NO im not just a lightweight sandbag fan.. etc.. etc.. etc..
Hello every fans of PJ Harvey! I am a french new fan of PJ Harvey's songs. To be true, i am a newbie though i know her for years. The fact is I never payed attention to their works before (feel shame) until a few months ago. Then i was ashamed what this artist is able to do. So i decided to register here to share news with all the community. See you among the osts here! I'm pj fan since about 1995. I remember to hear a concert on radio: Nirvana in Rome. After the concert go another song: Naked cousin by PJ Harvey. After this moment i search PJ music. I've buy some album. So i known her music, i love Dry, This is Desire, also Hum hum her and Stories from the City, Stories from the Sea, difficult with Rid of me. After, the subsequent albums i found more close, White chalk and A Woman a Man Walked By, i'm not found the freedom that i found previousoly, the resarch of voice that i know. I think is a stop of this resarch like another artist that i love, Tori Amos. So, for a few years i'm not followed PJ, however i listened her old e beloved music. Now, in this year, i went to youtube to see my favourite artists and i discovered a new album, new songs. I've listened these and i was struck (traduction is ok?). Listened and listened the new album Let the England Shake i undrstand that this music is very high level, are a new step in the research of PJ. Songs are beautifull, i love All and Everyone, but the others are considerable. Great musician accopany her and her choise is interesting, this is a concept album, i think. And her voice go up and down, altough sills influenced by previous albums. Wellcome back PJ. Now i wait, like you the new album. I searched on web a forum of PJ, but this is the only one. I struggle to understand the arguments, but I liked to share my thoughts. Sure to be understood by someone. Sorry for my English, i will follow you. Greetings! And welcome to the Garden. There's lots to read, be sure to check the archives for old posts. Welcome aboard! that's a great forum to find infos. Don't hesitate to share things. I’ve posted a greeting on the ‘Meet the Gardeners’ thread but I think that may take some time to be noticed so I will post here as well! Of course it won’t be as good trying to remember what I said. I heard ‘Sheela-na-Gig’ when John Peel first played it in 1992, and that was it, really. Since then PJ has woven in and out of my life remarkably, and I now find myself in the position of having to have two Polly-less days a week, a bit like not drinking to make sure you aren’t addicted. I come from Dorset so that’s a large part of it: whenever I find myself back there the words are there too (I was at the chapel at Abbotsbury last week: it’s full of pigeons at the moment and stinks of guano). I’m booked in at the Brixton Academy in October and my long-suffering young lady is even coming, to hold my hand as I weep solidly for an hour and a quarter. I’ve already found some very helpful information on the forum, so thank you so much for maintaining it and for having me here.